This is the fifth in a series of "blogicles" on how Mess Mapping™ and Resolution Mapping™ processes that can be used to represent, analyze, evaluate Wicked Problems and then to choose actions that ameliorate the Wicked Problem at hand. 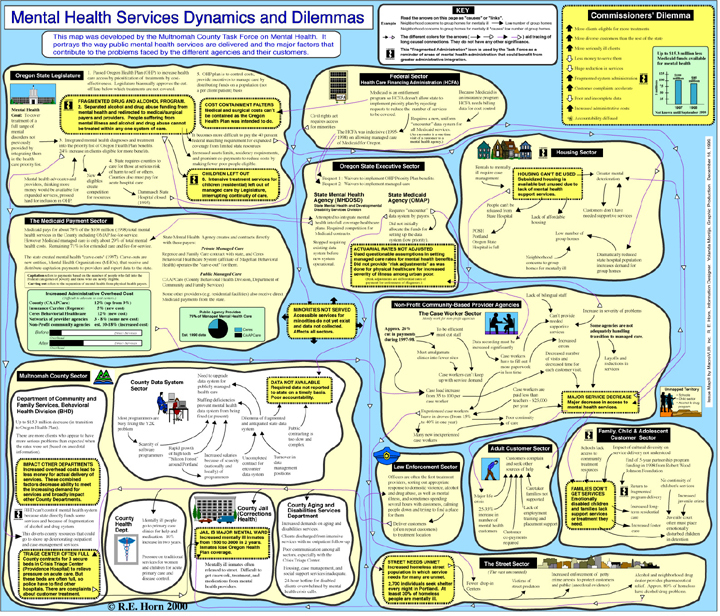 It is quite usual to be mystified initially by the look and feel of a Mess Map digram and perhaps to be put off by the tightly packed complexity. However, it is useful to remember that you are looking at the final product, not the steps along the way. Moreover, the Mess Map digram was not made for you to look at, but for the task group who was involved in every step of the way, from the initial (almost blank) template to the final product. It contains their words, their arrows and their boxes. It was not made for outsiders to find it attractive or informative (although they often do). Perhaps looking at some of the most important components of a Mess Map will enable a deeper appreciation for the way they portray complexity. Even though the outsider sees these as messy components or aspects of the Wicked Problems, each of these elements is carefully structured, labeled, and often color-coded to articulate the mess map adequately enough to use it for the next stages. 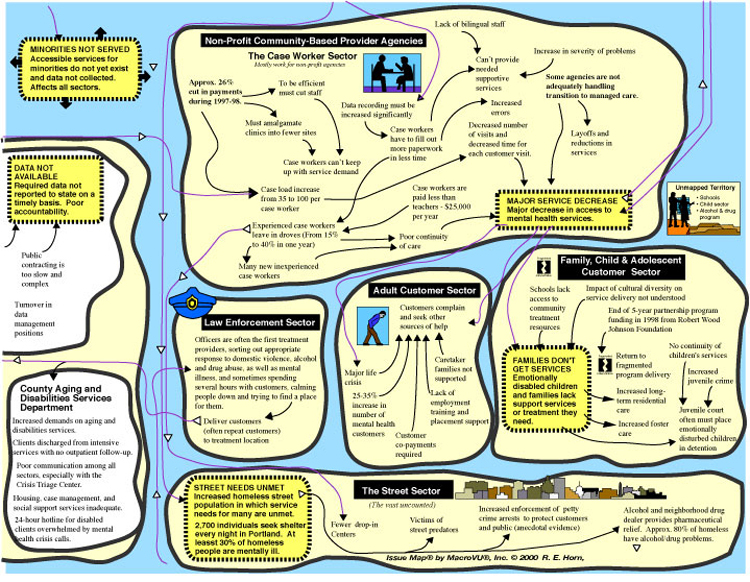 A Mess Map diagram is comprised of various visual language units each of which may describe an aspect of the problem, system, or relevant facts. For example, all of the major organizations involved in the mess have their place. If there are large numbers of similar organizations, frequently they can be grouped together as a sector. These sectors are represented by the "blobs" on the map. We have described Social Messes as interlinked clusters of problems. These are always seen from different points of view depending on what sector or organization is feeling the “pain” of the mess. Within the sector blobs they are represented as deeper yellow boxes containing descriptions of the problems as seen from that point of view. Often we can see that these problems or issues are held in place by causes of different kinds (rules, customs, culture, psychological pressure, bureaucratic, statutes, and even constitutional interpretation and precedent). These causes are represented by the other little chunks of text on the map. They are linked to the problems by causal arrows. We note that the causes of the problems often have their “source” or powerful rigidity in other sectors or organizations (that is, other blobs) and, thus, the colored arrows represent causes crossing these boundaries. Sometimes critical quantitative data structure the interpretation of the experienced pain or issues (the green boxes). Thus, multiple systems-to-systems relationships are presented.